The exquisite traditional style of wrought iron balustrade is found in the Grande Forge Mozart Line. Let yourself be charmed with this beautiful selection of fine art hand made products. Furthermore, the Grande Forge Mozart Line is available for you at FGS Australia. Stylistic composition takes on its full meaning in the Grande Forge Mozart Line. These ornamental railing components however, from the Mozart Series, are sure to create a conversation piece when guests arrive. 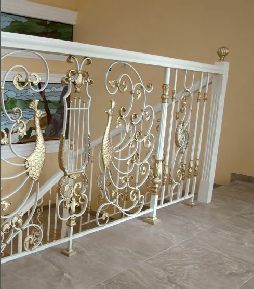 Furthermore, the detailed ironwork with combinations of elegant leaves and also flowers or of a stylized peacock will elegantly enhance your staircase, balcony or other ironwork design. Therefore, the stylized ironwork makes the Grande Forge Mozart Line the choice for those who desire to recreate the splendour of metal works in ancient palaces. The Mozart Line inspired by nature is unique in the ironwork. You can find here the great imagination of the artists, the excellent interpretation of the blacksmith and also the perfect touch of the patinator. Sinuous leafs; delicate flowers, juicy fruits, romantic doves and also royal peacock, intertwine in this exceptional range, recreating an original image of ART. Grande Forge Mozart Line is one of the most amazing products offered by Grande Forge of France. Even more, the company is a world leading manufacturer of many types of balustrade systems. These systems range from more contemporary designs all the way through to the unique nature inspired ironwork of the Grande Forge Mozart Line.